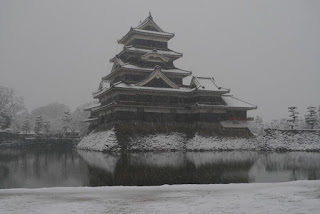 Matsumoto Castle is one of the top three most visited and best preserved castles in Japan. One of the others we've already seen - Himeji. 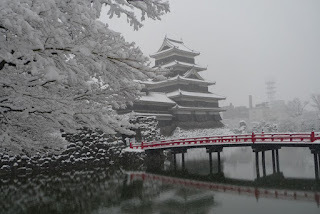 Matsumoto is another 16th century wooden castle and is set in a park and is surrounded by a small lake or big moat. The castle is indeed covered by snow. Everything is. 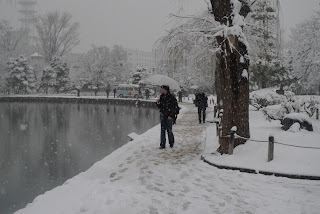 We've probably had 15cm since we arrived in Matsumoto. 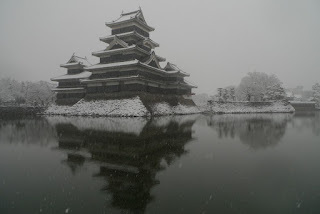 Matsumoto Castle is used for movie and tv show sets. We know that because something was being filmed while we were there. There were big cameras and little cameras and camera dollies and cranes. There were dozens of people standing around or looking busy. Actors dressed as ninjas holding plastic guns. Guns that looked like super-soakers. There were guys dressed as 15th century Japanese soldiers also holding plastic futuristic weaponry. God knows what kind of movie or TV show we'd stumbled upon. There were news crews filming the castle too. 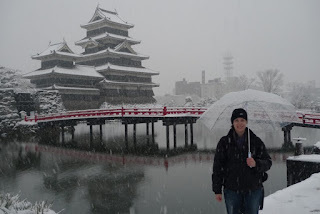 It was obviously a big deal to see the castle in the snow. After the visiting the castle it was time to drop the Mazda off at Mazda car rental. 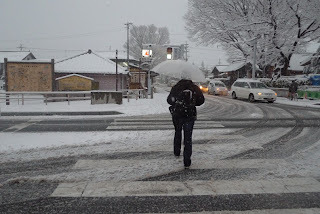 Now it was quite challenging driving in the snow in the dark and find the place. But find the place we did. About 10 minutes before they closed. Less painful dropping off the car than picking it up. The mechanic gave it the once over, gave the thumbs up and it was done. Not like the hour and half marathon to pick it up. 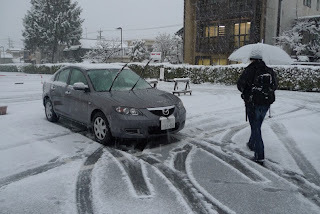 They were also kind enough to drop us off at the hotel.